In celebration of their new fragrance range, Axe Gold, Axe held a lit party on Wednesday, July 25, with performances by Black Coffee, Da Kruk, Zulu, Distruction Boyz, Benny Maverick, and Nasty C! 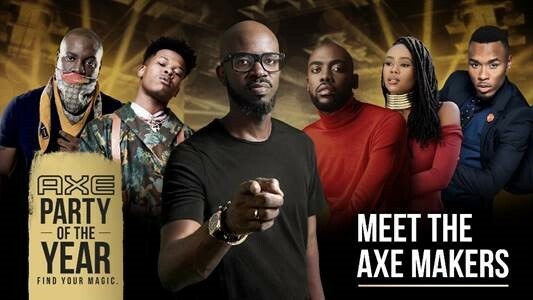 The #AXEPartyOfTheYear was headlined by international DJ, Black Coffee, who kicked off the campaign in May by inviting South Africa’s best talent, including Nasty C, Bontle Modiselle and Rich Mnisi, to join him in discovering young creatives and empowering them to find their magic and share it with the world. The #AXEPartyOfTheYear marks the end of the search and celebrates guys who’ve embraced who they are and become their most attractive selves. Hundreds of fans who won exclusive tickets were not disappointed as they witnessed the celebration. “The magic that unfolded on stage and in the crowd at the #AXEPartyOfTheYear proved to be the height of talent and passion that we know lives inside the hearts and souls of all South Africans,” said Unilever Marketing Deodorants Director, Keegan Alicks.